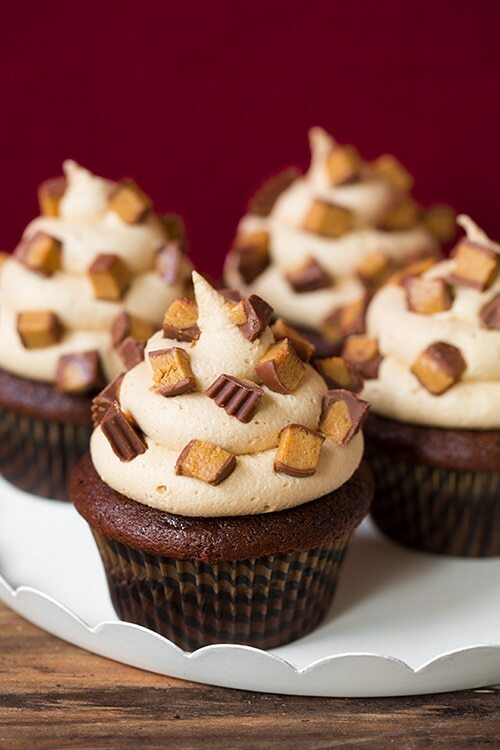 If you like Reese’s you’re not going to want to miss out on this cupcake! 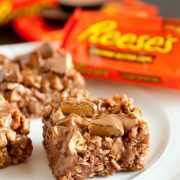 With these you get a delicious chocolate cupcake that’s baked with a Reese’s in the batter, then it’s topped with a fluffy and decadent peanut butter buttercream frosting and of course it’s finished with more Reese’s. Chocolate and peanut butter were meant to be together and thank you Reese’s for proving that :). My husband labeled these as “to die for!” and it’s a term I’m quite certain I’ve never heard him use before. 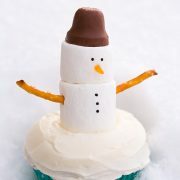 My kids also loved these and they had so much fun making them with me. 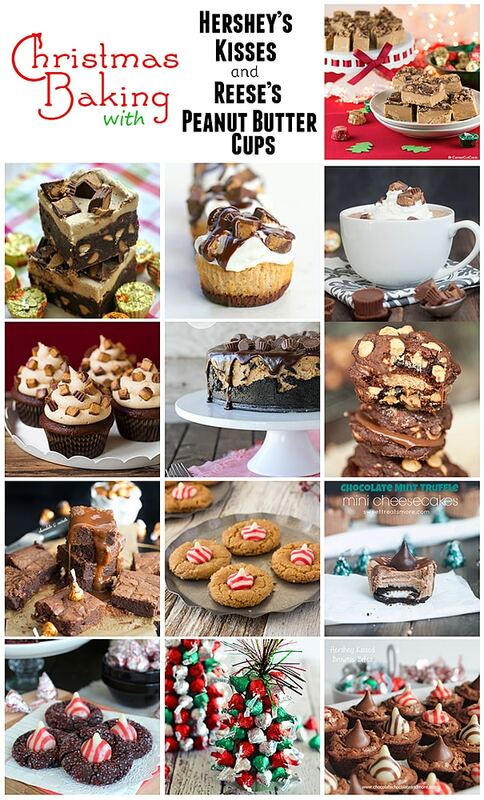 Today, I am excited to be a part of a Hershey’s sponsored blog party that includes so many talented bloggers. 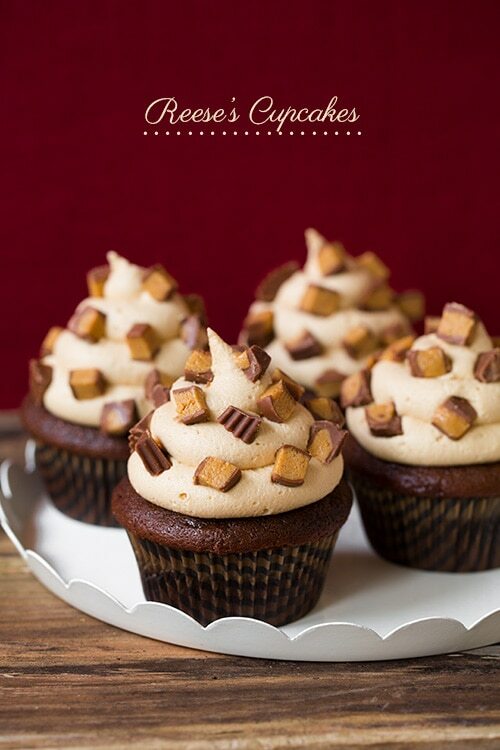 These cupcakes are perfect for the holidays because how many people do you know that don’t love Reese’s? They are basically a guaranteed hit. While everyone else is bringing the traditional holiday treats to the party, if you show up with something not so traditional like these, people are going to flock to them. These are love at first bite, once you take yours you’ll see what I mean. They may just become a new holiday tradition. And if your like my family, you’ll find Reese’s in your Christmas stocking every single year, save some of those Reese’s for these, you’ll be glad you did. Enjoy! 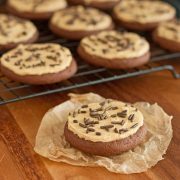 A decadent soft and fluffy chocolate cupcake topped with a rich and creamy peanut butter frosting! Preheat oven to 350 degrees. In a large mixing bowl whisk together flour, cocoa powder, granulated sugar, brown sugar, baking powder, baking soda and salt for 30 seconds. To dry mixture add in vegetable oil, milk, egg and vanilla extract and beat with an electric mixer on low speed for 2 minutes. Pour in hot water and stir until well combined. Add in sour cream and mix until combined. Fill each paper lined muffin cup with 2 Tbsp of batter, then top with half of a Reese's (in the center) then divide remaining batter over cupcakes (about 2 Tbsp per each) and bake in preheated oven for 16 – 19 minutes, until toothpick inserted in center of cupcake comes out clean (or with a few moist crumbs). Remove from oven and allow to cool several minutes in muffin pan then transfer to a wire rack to cool completely. Once cool frost with Peanut Butter Buttercream Frosting, chop remaining Reese's and top cupcakes with chopped Reese's. Store in an airtight container. In the bowl of an electric stand mixer fitted with the paddle attachment, whip butter and peanut butter on medium-high speed until pale and fluffy, about 6 minutes, occasionally scraping down sides and bottom of bowl. Blend in vanilla, sour cream and powdered sugar and slowly add cream to reach desired consistency (taste and you may want to add a pinch of salt depending on how salty your peanut butter is), then whip mixture on medium speed until pale and fluffy, about 5 - 6 minutes.